Set in the heart of the Tonto National Forest along the Mogollon Rim, this lodge is part of a working 55,000 acre cattle ranch that offers something for every visitor and level of rider. It is also rich in old west history and culture – located near the site of one of the gunfights of the infamous Pleasant Valley War. The war is one the most famous of the range feuds in the American West, the subject of a number of nonfiction books, as well as the source of a number novels (including one by Zane Grey) and movie plots. The lodge is a study in rustic elegance, providing all the modern comforts, while staying true to its working cattle ranch history. Guests will enjoy the accommodations at the lodge – the spacious great hall with its fireplace and leather couches, the supremely comfortable bedrooms, the deck overlooking the lake and the patio with its fire pit. The lodge is the perfect place to relax when not out on the trail on well-trained, responsive horses, or taking advantage of the many activities around the ranch, including the roping arena, rifle range, 3-D archery course, sporting clay course, four-wheeling, fishing, hiking and more. The family-owned lodge opened to the public in 2008 and now offers a variety of riding opportunities that accommodate every level of experience including 'cowboy skill' classes, trail rides, half-day, day-long and camping excursions to explore Indian ruins, remote line cabins, or to the sites of gun fights in the Pleasant Valley War. Experienced riders can also go out with the ranch hands to experience the cowboy life, monitoring livestock & range conditions, riding fence lines, rounding up, driving and working the livestock. The trails wind through diverse and breathtaking terrain: Ponderosa pine forests, running streams, riparian valleys and canyons, stands of aspen, juniper, oak and chaparral, and open grass lands. Beginners will enjoy wide, slow-curving trails that wind around the hills and through the gullies around the lodge. These trails are relatively flat, mostly graded and very easy to follow. More experienced riders will want to take advantage of the more challenging trails and cross country excursions. Trails climb across ridges, gullies, valleys, mesas, hills and peaks. Some of the paths are fairly narrow, full of switchbacks and traverse steep rocky slopes, but provide some of the most spectacular views of Pleasant Valley and the wildlife hidden deep in the woods. If you decide to drive in - please note that it is partially on dirt roads and a 4x4 or SUV is recommended - especially during winter months. Arrival can be any day of the week - open all year. It's best to come between April to October as there's chances of snow and bad weather between November to March. There is so much to do at our lodge! Buried deep within the Tonto National Forest, guests are able to experience the full natural beauty of the Arizona highlands. Whether you feel like strapping on a pair of jeans and cowboy boots and hopping in the saddle of one of our beautiful horses, flying around in our four wheelers, or venturing out on your own for a hike, you’ll take in the Arizona wilderness like never before. Feel like experiencing rustic Arizona but don’t want to leave the comfort of the lodge? You don’t have to! There is plenty to do right outside our front door including fishing on Lake Sharon (watch out the fish bite like piranha!) or practicing your archery or shotgun skills. Our all-inclusive packages each activity day includes one trail ride or an ATV tour. Riding clinics available -- please inquire. A 10 station 3-D target archery course are also available (extra charge). Pace: Slow with some trots and canters according to riding level. Working cattle may require fast canter and occasional gallop. Trail rides are in mountainous trails. Experienced riders and beginners alike will find everything they need to enjoy and take advantage of the lodge’s miles of trails, beautiful horses and professional equipment. Our horses were bred to traverse the diverse terrain of Pleasant Valley. Any level of riding expertise can be accommodated. Our staff will help find the horse just right for you! Each staff member has grown up with horses and taken care of them all their life. They take pride in the quality and care of each animal at the lodge. For more experienced riders ready to hit the mountain trails on arrival, there are over 100 miles of trail on 55,000 acres of land around the lodge. Some trails are gentle and wide enough for wheeled vehicles. Others are steep, winding paths that cut through the hills on their climb to the top. Riders will need to have a moderate level of experience before tackling the steeper trails. There are a variety of trails to take that will keep guests entertained for days exploring the beautiful country around the lodge. Or, if a guest would like to experience an actual day in the life of cowboy, he or she can accompany the ranch hands as they tend to the actual business of the ranch, monitoring the horses and cattle, riding the fence lines and so forth. In Arizona, we calve year-round and practice stringent range management. The working the cattle often includes roundups, branding, sorting, weaning, vaccinating, castrating, moving to new pastures. Our program is very flexible -- make sure you talk to our ranch manager about what you would like to do during your stay! Average temperatures do tend to vary at the lodge over the year, giving a very temperate climate compared to most of Arizona. The lodge receives a dusting of snow each year, but has seen up to three feet of snow before! Temperatures reach just over 100°F in the summer. Please be sure to pack correctly for the season. For a brief but spectacular three weeks in September, the foliage undergoes a magical change around the Valley. Brilliant reds, oranges and yellows cover the deciduous trees. December through late February the lodge receives a dusting of snow and the occasional winter wonderland storm. Temperatures reach below freezing at night, so be sure to pack plenty of warm winter clothing and cozy up by the fire. Spring and fall temperatures are very temperate with an average between the low 70s to mid 90s (degrees Fahrenheit). It’s the perfect escape from the still blazing heat in Phoenix. July and August are the hottest months of the year, while August and September receive the most rainfall of the year. Summer temperatures can climb well into the high 90s F during the heat of the day in Young, Arizona, while winter nights can plunge below freezing. Depending on when your stay is, always come prepared for the seasonal weather and temperature! Please see the climate section for the chart on average temperatures. That being said, here are some items you will want to bring year round. The handsome lodge accommodation here in Pleasant Valley can be well suited to just about everyone. 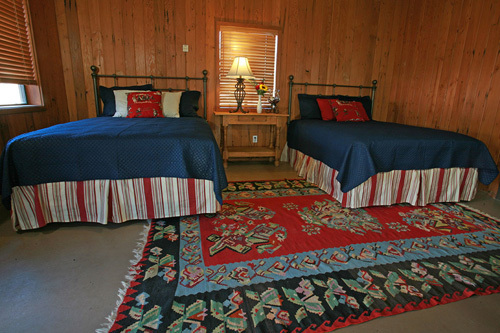 The lodge has 5 guest rooms - with king, queen and double beds available pending. A crib and pullout bed are available for families with young children. 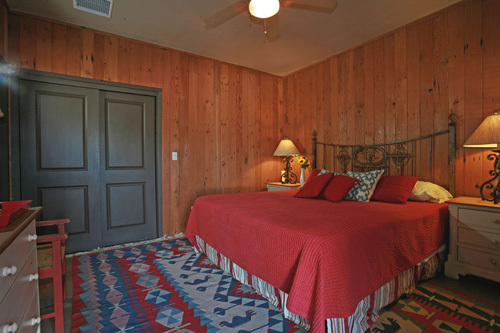 There are two rooms that share one bathroom (Queen Anne and 60 Caliber - included in the Wrangler Package), two rooms each with private en-suite bathroom (Lakeview Retreat and Ambush Hill Loft - included in the Cow Boss Package), and one superior suite (Deluxe Hideaway – included in the Owner’s Hideaway Package). The Rustler’s Roost, Wranglers Rack and Bunkhouse Suite are in a separate bunkhouse building, located less than two hundred feet from the main lodge, situated closer to the horses and other livestock. Of course, all guests are encouraged to enjoy the main lodge amenities. Free Wi-Fi internet is available to all guests, as well as a washer and dryer. To maintain the natural environment around the lodge we are solar-powered and green friendly! Double French doors that swing out to the lodge’s back deck and fire pit. The room features two double beds and shares a bathroom with the Queen Anne Room. This rustic Victorian room features a four-post queen bed, double French doors with access to the lodge’s fire pit and deck. It shares a bathroom with the 60 Caliber Room. Located in the bunkhouse apart from the main lodge, this room features a king size bed, private bathroom, an exterior entrance. This room is perfect for mom and dad, with access to the kid’s bunkhouse commons. This room for up to 4 is located in the bunkhouse apart from the main lodge. It features two queen size beds, a private bathroom and an exterior entrance. The loft provides a direct view from a private balcony on to the infamous Ambush Hill. It features a king size bed, private shower and walk-in closet. The open loft entry area can be equipped with a day bed and trundle (for a small extra charge). Aptly named, this room for 4 overlooks the length of Lake Sharon. You can watch the sun reflect off the water as it dips below the horizon from the deck. Lake View Retreat features two queen size beds, a private bath and shower, exterior entrance to the lodge’s main deck. This luxurious room is the most spacious at the lodge and is outfitted with everything that will truly make you feel like the owners. The room features a king size bed, French double doors out to a private redwood deck, stone fireplace, plasma screen TV and a private bathroom. After a long day riding the trails, sit down and relax in the large soaking tub or oversized shower. The bunkhouse commons is the perfect room for your kids! Apart from the main lodge, this room features 6 twin beds, two bunk beds and two trundle beds, with one bathroom to share and a kitchen unit (the bunkhouse commons is offered at a reduced per person rate). These quarters are not of the same luxury standard as the lodge rooms, but still very clean and comfortable. Single supplement is only applicable if you are unwilling to share. Meals prepared are family-style or buffet! Hamburgers – grilled out back and served with salad. Chili dogs – These are not your typical hotdog. These giant dogs (1 pound) are grilled out back and topped with chili, cheese and onions. Pulled pork sandwich with slaw on homemade buns. Sliced brisket of beef sandwich on homemade buns and served with salad or slaw. with a ginger soy dressing. Some of our adventurous guests need to take their lunch out on the trail – be it a horseback ride, jeep tour, or nature hike! Usually it would consist of something similar to: Shaved ham or turkey sandwich on homemade bread with all the trimmings, homemade potato salad or coleslaw, fresh veggies and brownies for dessert. Water and house beverages. Ribeye Steak – This is a Prime 16 oz Ribeye steak grilled out back (or ready for you to grill in the pre-prepared meals). It is served with salad, a twice-baked potato (or ready to heat), fresh baked garlic bread and dessert du jour. Grass Fed Beef from the Ranch -- When available -- Ask the Chef about availability and the particular cuts of beef that are available. Chicken Piccata - Chicken breast sautéed in butter with lemon and capers and served over angel hair pasta. Served with a fresh green salad, freshly baked French bread and dessert. Cherry Creek Chicken and Dumplings – Our version is a thick and creamy chicken stew served under a latticework of puff pastry. A mixed green salad with berries and goat cheese and dessert are included. We always finish with something sweet from our kitchen!